Are you remodeling or renovating a room in your house? Perhaps you’re adding another bedroom or home office. Whatever project you’re working on, our flooring showroom has a full variety of floors that are sure to suit your needs. Our luxury vinyl flooring in Williamsport, PA, is a popular flooring choice due to its range of appearances, easy maintenance needs, and low prices. If you need assistance finding the perfect luxury vinyl tile or plank flooring for your home, let our knowledgeable and dedicated staff help advise you. Once you’ve chosen the ideal flooring for your needs, our experienced and skilled installer can install it for you according to your schedule. Whether you prefer the look of stone, ceramic, hardwood, or any other material, there’s likely an LVT style to suit your tastes. Luxury vinyl plank flooring mimics the appearance and even the texture of wood flooring and is available in almost any species, wood grain, tone, or size. This makes it a low cost and easy to care for alternative for anyone who is looking for an elegant or traditional look for their home. Luxury vinyl tile is a great choice for the kitchen, bathrooms, or any other room that experiences high levels of moisture or humidity. This type of flooring can look like marble, ceramic, or natural stone but has none of the intensive maintenance needs or the heavy weight that stone and ceramic do. Ensure your new flooring lasts for many long years by scheduling luxury vinyl flooring installation with our skilled technicians. Our experts are able to come to your house, remove your old flooring materials completely, prepare the subfloor, and correctly install the new floors. By leaving this difficult task to us, you’re also covered by our Lifetime Installation Guarantee. If you ever experience installation-related issues throughout the lifetime of your floor, we’ll make it right at no expense to you. 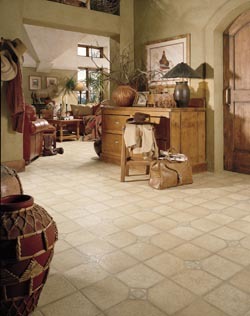 Contact us to schedule luxury vinyl flooring installation with our team of experts. We’re proud to serve clients in Williamsport, Pennsylvania; Jersey Shore, New Jersey; Muncie, Indiana; and the surrounding areas.